This is a very common problem for sweet cherries. Nearly every box of packed fruit has fruit with some pitting or bruising. Pitting and bruising are leading causes of product rejection and requests for price adjustments by produce receivers. Pits are small sunken areas on the fruit surface, larger flattened areas are called bruises. Symptoms are primarily caused by a mechanical impact or compression. Although any other mechanism that damages fruit tissue may cause similar symptoms. Damage becomes apparent after several days at room temperature or longer at lower temperatures. Pitting is associated with damage to cells near the epidermis which collapse over time. Bruising appears to be associated with injury to cells much below the epidermis. 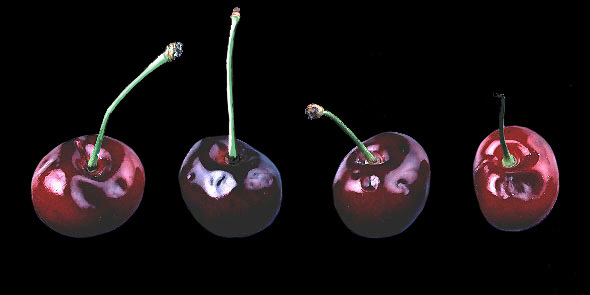 Impact damage increases cherry respiration, ethylene production, and susceptibility to decay and damaged fruit loose titratable acidity at a faster rate compared to undamaged fruit. 1) keeping drop heights lower than 30 cm (12") for fruit landing on a smooth surface, 2) preventing fruit from falling on rough surfaces, 3) installing padding, 4) keeping water drop heights less than 20 cm (8") in shower type hydrocoolers, and 5) using the slowest possible fruit speeds on cluster cutter machinery. Bruising is mainly caused by pickers holding fruit when they remove it from the tree. They should be trained to touch only fruit stems. Packinghouse design features that reduce pitting also minimize bruising. Mitchell, F. G., G. Mayer, and A. A. Kader. 1980. 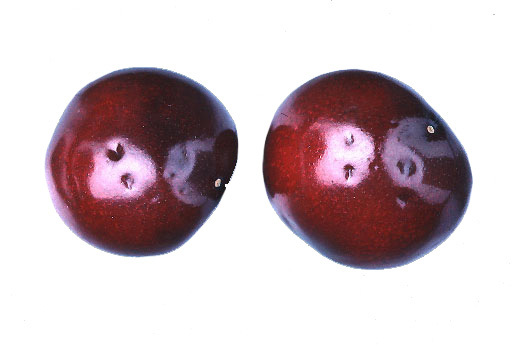 Injuries cause deterioration of sweet cherries. California Agiculture 34(3):14-15.